The Smoky Hill Museum gets hundreds of research questions each year. Here are a few of the most frequently asked questions. If you don't see what you are looking for, contact Jennifer Toelle, Curator of Collections and Research. What was the Smoky Hill Museum building originally? Why is the area called the Smoky Hills? How did Salina get its name? What is the connection between Camp Phillips, Smoky Hill Army Air Field, and Schilling Air Force Base? 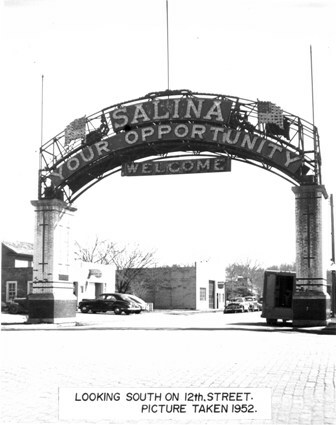 Where was the "Salina: Your Opportunity" sign? How do I donate an item to the Museum? It was February 1858 and with the severest weather behind them, three men set out west from Lawrence intent on founding a new town. Two locations had been scouted out the previous year: one along the Blue River not far from Manhattan and the second on the banks of the Smoky Hill. Because the Blue River flooded the first site, William A. Phillips and his companions, James Muir and Alexander Campbell, continued west and selected the Smoky Hill River site for their town. Phillips liked this site for its natural advantages of water and timber, as well as its strategic location for future settlement. He also believed chances were favorable that a railroad might soon be routed through the region. Using a compass placed on Phillips’ stove top hat, the men drove stakes and made a rough survey of the town, noting in the Town Company minutes that adjustments would be made when the official government survey was completed. A month later, Alexander Spilman and Robert Crawford arrived bringing the first load of provisions to the new townsite. In the middle of March, Spilman, Muir and Crawford completed a preliminary survey, marking off the streets, blocks, lots, squares and public ground. The original boundaries of Salina consisted of Front Street on the east; Ninth Street on the west; North Street on the north; and South Street on the south. The main north-south street was called Santa Fe because it pointed south towards the Santa Fe Trail, a freight road that ran through present-day McPherson County. The main east-west street, Iron Avenue, ran down from the rise east of town known as Iron Mound. The Smoky Hill Museum was dedicated in 1938 as a federal post office. Designed in the Art Deco style. It became home to the local museum in 1985 when the collection moved from the former bath house in Oakdale Park. “Land” and “Communication” greet visitors climbing the steps of the Smoky Hill Museum. Commissioned as a Section Project, similar to the WPA, to adorn the post office building, these figures are carved from the same Indiana limestone used for the building. Designed by Carl C. Mose and executed on site by his assistant Jon Jonson in 1940, the sculptures represent the pioneer spirit. Allegorically, the man, “Land,” symbolizes agriculture. The woman and child, “Communication,” symbolize the relationship of the family and the community to federal services. Based on these sculptures, the building was listed on the National Register of Historic Places on July 18, 1989. Native people first noticed the blue-gray haze hanging among the sandstone bluffs and dark rock formations, and called this area the Smoky Hills. Another legend says the name came from early travelers who saw cottonwood trees along the riverbanks swaying in the wind, giving the impression of smoke hovering in the air. The name Saline was given to the river, and later to the county on account of the salt marshes in this area and the high salt content of the river, which probably comes from the large salt mines farther south near Hutchinson. The name of the town, Salina, is probably a variation of Saline. Pronunciation of Saline is Say - leen'. Salina is pronounced Suh - li' - nah. By the 1940s, the Smoky Hills region found itself in the middle of World War II with the establishment of Smoky Hill Army Air Field (SHAAF) and Camp Phillips. Construction of the Air Field began in 1942. Originally built to support the B-17 “Flying Fortress” and B-24 heavy bombers, it operated for five years after the end of the war. It was deactivated in 1949. Camp Phillips was named after Col. William A. Phillips, a town founder who served in the Civil War. It was established as an Army training camp and prisoner of war internment camp in 1942 and served an important role in preparing soldiers for World War II until 1944. It was dismantled in 1945-46. Smoky Hill Army Air Field was later transformed to train pilots and mechanics for the new B-29 “Super Fortress” heavy bombers and in 1951 was designated as a Strategic Air Command Base. On March 16, 1957, SHAAF was renamed Schilling Air Force Base after Col. David Schilling, a WWII fighter pilot. Schilling continued to provide a military influence in the Smoky Hills region until 1966 when the federal government closed the base. The following was a Bicentennial feature in the Salina Journal in 1976. Text is by James Geisendorf. On Sept. 2 1916, permission was granted by the city commissioners to the Chamber of Commerce to erect an electric sign on 12th Street near the then new Union Station. “erected on an immense structure of steel, in splendid harmony of colors, standing out in bold relief at an elevation of 20 feet with a scintillating and shimmering border effect. With her proud boast in large white letters and her beautiful colored border can but mark and favorably impress the minds of all observers. The above is a newspaper description of the new sign after its erection. The sign contained over 1200 bulbs, and at the time was known as one of the most beautiful electrical signs in the country. The Salina Light Power and Gas company agreed to maintain and operate the sign for the city of Salina at no cost to the taxpayers. It was the pride of Salina citizens and was seen by thousands of the cities visitors as they arrived or departed by train for many years until it finally fell into disrepair, the lights burned out and were not replaced. After World War 2 the sign was taken down and scrapped. Thank you for considering a donation to the collection. It is only through the generosity of people like you that your Museum has such an outstanding collection. It is a legacy that will be enjoyed for many generations from the people of the Smoky Hills Region. Please contact Jennifer Toelle, Curator of Collections, at the Smoky Hill Museum, 211 W. Iron, Salina, Kansas 67401, 785-309-5776, jennifer.toelle@salina.org. No, we do not offer appraisal services.